Note: This does not mean, that you can stack any I2S sound cards on the Raspberry Pi. It works here, because one board acts as the master (the Digi) and the other as slave. Also the configuration is a bit tricky. Only the HiFiBerry Digi is configured as a sound card. Linux doesn’t know, that there is another card connected. P.S. We’re in the last phase of the HiFiBerry Digi production tests. Everything looks good at the moment. 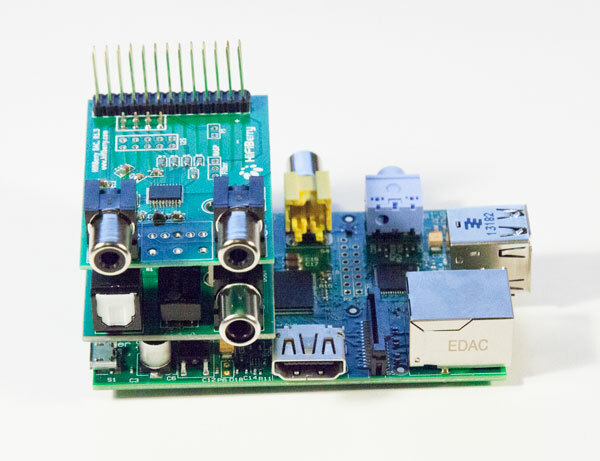 This entry was posted in Projects and tagged dac, digi, hifiberry, raspberry pi, S/PDIF on January 19, 2014 by Daniel. I would like the Digi and the Dac simultaneously be mounted via the stacking headers on a RPI. It is sufficient if the P1 (2×13) is extended by the stacking header or P5 (2×5) must also be extended? Below is the Digi, above the Dac.